Clearing the Browser and Java Cache: Do This First! There are certain rules, tried and true practices, that you always try first before you call someone. In IT the first one is restarting an application and the second one is rebooting the computer. After those two, the order becomes debatable. Unfortunately, many of us know folks that call us before even trying one and two. I present to the world of Business Objects and in fact, the world of most web based applications, a third practice that you will always want to try before calling someone (or have your users try before they call you): clearing the browser cache and the java cache. Make certain that "Cache" and "Authenticated Sessions" are selected, the other options are up to you if you want to include them. You may want to add "Offline Website Data" too. I usually select to delete off-line content too. Open the Java Control Panel by looking in your PC's control panel or by double clicking the Java icon in your system tray. On the "General" tab click the "Settings" button. 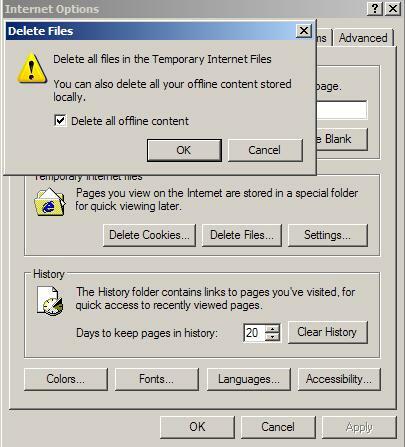 Click "Delete Files". You could also click the "View" button and then hand pick the BO related applications, resources, or deleted applications that you want to dump. Be aware that the next time you access java web components, such as the java query panel, expect the initiation to take some time. My favorite error is “Internal Error: the value of parameter lang is invalid”. It is perhaps one of the least helpful in a sea of un-descriptive errors. This error is a client-side error and can be quickly resolved with just a clearing of the browser cache in many cases. « WebIntelligence Report’s Save As CSV Has a Problem?